fastest skaters available in the upcoming Draft. Much of the hype surrounding the 2008 NHL Entry Draft surrounds Steven Stamkos. 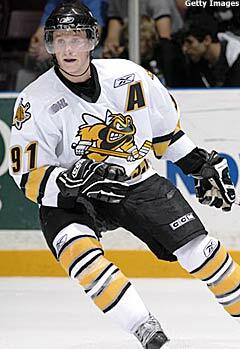 The 18-year-old Sarnia Sting star forward already has been named the top-rated player by NHL Central Scouting, he’s dined with Gordie Howe, hung out with Sidney Crosby before a game, been besieged by teams and media for interviews, and even is the subject of his own Web site. Heck, he’s got his own troupe of dancers! So is one player worth all this attention? Feaster, the man charged with making that first pick, admits Stamkos’ selection could be the worst-kept secret in hockey. Stamkos is more than just a fancy marketing campaign or some cool YouTube videos – just search for Stamkos on the site and an array of physics-defying goals are there to watch. To go along with his 58 goals, 47 assists and 105 points in 61 games this past season, Stamkos was a team-best plus-18 and added a team-high five shorthanded goals. He continued his excellent play in the Ontario Hockey League playoffs, finishing fifth with 11 goals despite playing just nine games, the fewest of any player in the top 20. He also had a strong showing at the World Junior Championships, finishing with a goal and five assists for six points, tying him for second in scoring as the second-youngest player on Canada’s gold-medal squad. Beyond that, Stamkos is easy to get along with away from the ice, something his fellow top prospects have found out. If Stamkos has his way, the next game of hockey he plays will be in the NHL. Some around the NHL believe that is a distinct possibility. Feaster believes if Stamkos can add some muscle to his 6-foot, 176-pound frame, he can do it. “It’s the strength, I think that’s the biggest thing,” said Feaster. “At the end of the day it’s about playing in a men’s league and it’s about playing against men. … I think that’s the biggest thing – he’s going to have to work hard this summer, be ready for training camp.